I was at 41 weeks and keen to have my baby when he was ready. On Monday the 2nd of October me and my husband Mweemba did the walk along the Swan River in Peppermint Grove/Claremont suburbs. There were a few slopes, I was hoping this would help with starting the labour. On Tuesday the 3rd of October I woke up around 3:30am to go to the bathroom and I saw the first show. Things were starting! At this point I was 41 weeks and one day. That morning I woke up feeling minor cramping; it made me feel confident Hilawo was on his way to meet us very soon. We went to take a walk at the beach and I was able to sleep well all night on Tuesday. The cramping felt constant at that point, I could not distinguish a surge unless I lay down and relaxed. I let our midwife, Vanessa (Simply Midwifery), know what was happening. Vanessa came in that evening to listen to the bub and reassured us. On Wednesday morning, by 8am I was in early labour, having fairly spaced out surges since 6am, but certainly more intense compared to what I had been feeling. I let Vanessa know about the progress and the fact that there was no slowing down. I read about labours starting and stopping and was hoping that wouldn’t happen to me. From 9am until 4pm my surges continued picking up the pace and intensity. Mweemba was with me all the time, helping me move around, time the surges and providing water and support/massage. Of all positions I had been in, sitting on the fit ball and softly rocking helped the most, half way through the afternoon that was the only position I wanted to be in. We did a bit of walking outside the house, but I was on the ground more than up, so we gave that up. I don’t think I had back labour, mostly the sensations of surges were moving from my back to the sides and then to the front of my core. Relaxation massage Vicki (Vicki Hobbs, Childbirth Educator & Pregnancy Massage Specialist, Hypnobirthing Australia certified practitioner) taught us at the class helped for a period of time; we tried a few positions as well. As the intensity of labour picked up I didn’t want much done to me, just breathing and being on the ball was all I wanted. We had the hypnobirthing tracks playing pretty much the whole time and had relaxing essential oil in the diffuser. Music/tracks helped a lot; I had been listening to all of the ones Vicki recommended (from Hypnobirthing Australia) in later months of my pregnancy. From around 2pm I was on the ball all the time, trips to the bathroom became more difficult, I kept Vanessa informed about everything as we had already started timing the surges. Close to 4pm Mweemba filled up the bath tub, unfortunately being on all fours and partly in the water didn’t really help, the ball was a lot more comfortable. At this point Vanessa had arrived, I remember telling her that I wasn’t sure I could do it, which is a common sign of transition. At 5pm Mweemba started filling up the pool and by 6pm I was in the water. It was nice and comforting, I instantly felt the pressure reduce! Pushing took a while; I needed some help with understanding what to do. I first started feeling the urge to push around 6:30pm and Hilawo was born at 9:47pm, proper pushing took an hour. I remember the sensation of the head not passing and putting lots of pressure on the bone, but it did pass in the end. Baby’s heartbeat was all good throughout the whole labour, so we continued. If I was at the hospital I doubt I would have been allowed to push for that long. 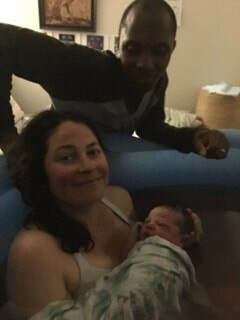 Being in the water made a big difference for me, I think I managed to have a successful homebirth because of it (along with many other things of course). Thanks to established connection with Vanessa and what I learned in the class with Vicki I didn’t panic and didn’t let fear take over. I stayed focused and connected to my body and occasionally asked for reassurance from Vanessa, she was great in supporting me. I am so grateful for having such support, shortly after Hilawo’s birth I couldn’t help thinking that had I not gone with the choices I made it would have been a totally different experience. I needed coaching on how to push the baby out, I didn’t want unnecessary interventions, I wanted to only have certain people present while I was in labour and I didn’t want to be rushed. Luckily everything was accomplished. Being able to have such positive birth was a gift, I certainly don’t take it lightly, and this is the memory I will be carrying throughout my whole life. I thanked Vanessa from the bottom of my heart for this. Postpartum care had been excellent. I couldn’t have asked for better service for me and my baby. From looking after me to teaching breastfeeding and being available to come and reassure us was invaluable. Hilawo was 3.95kg at birth and long, but was slow putting on weight, so it was very important to us getting him on track with the weight gain. Thankfully we managed to stay breastfed and not needing to supplement, I couldn’t have done that without Vanessa. I can’t imaging going for appointments so soon after giving birth either, I was pretty much at home for four weeks, it was a gift to have Vanessa come to our house for the whole 6 weeks postpartum. To me, choosing and independent midwife care and taking Hypnobirthing class delivered a great experience overall. Choosing where and how to give birth can be overwhelming, there is so much fear around the topic. I found the best option is the one you are most comfortable with and we are so happy with the route we have taken.